You are here:Home Anime Christmas Anime Figures 2017: Give the Gift of Anime! Christmas Anime Figures 2017: Give the Gift of Anime! Winter is here, presents are near, and Japan has a sleigh full of anime figures to bring home for the holidays! It’s time to get in the Christmas spirit with our wish list of 2017’s most festive releases. If your favorite anime character doesn’t have a holiday figure variant, there’s no reason to have a blue Christmas! Good Smile Company’s limited-edition Multi-Use Muffler can instantly warm up almost any Nendoroid or Figma figure throughout the winter months. Simply place the knotted scarf between the figure’s head and body joint for a ’tis-the-season transformation. Available in six colors to match any anime wardrobe, the multi-use muffler is more affordable than a Christmas Nendoroid or Figma release, making it the perfect stocking stuffer for otaku on a budget. Kuma Class Light Cruiser Kiso preps for a festive feast with her “too sweet” Christmas cake sliced up and ready to serve—but her baking isn’t the only thing you would be a fool to challenge! Far more than a holiday homage, Good Smile Company’s Kiso Nendoroid features optional faces and warship parts, complete with muzzle flash accessories, that let you switch to her Kiso Kai-II form. Bake up the battle of the season by pairing Kiso with Nendoroid’s Northern Princess and Kashima holiday releases for a threefold KanColle Christmas! Wielding Excalibur Morgan in one hand and hoisting a large sack in the other, Alter’s Altria Pendragon is prepared to determine the ultimate fate of both naughty and nice. Her fleece-trimmed ensemble pays tribute to the midnight blue of Saber Alter’s iconic armor while the festive Christmas trimmings decorating her cape and braided hair hint at the holiday cheer hidden within her bag. Fans are sure to appreciate Santa Saber’s exchangeable expressions and detailed 1/7-scale sculpt, which includes a removable Christmas cap and cloak for those wanting to display her petite frame and blonde locks. In this second installment of Megahouse’s popular Petit Chara! Sailor Moon Christmas Special series, your favorite Sailor Senshi celebrate Christmas with stockings, presents, and candy canes galore! The 55-millimeter (2-inch) chibi-size set completes the original team, including an angel-winged Sailor Moon and the final four magical girls—Uranus, Neptune, Saturn, and Pluto. Each Sailor Scout rings in the winter season while wearing a holiday-themed costume that softly shines with the glow of a Christmas ornament-like finish. Inspired by the Fate/Grand Order 2016 Christmas event, Good Smile Company’s Jeanne d’Arc Nendoroid aims to attain “Santahood” while armed with her trusty spear decked in holiday cheer. With special hands and ornament orbs to recreate her “Twin Arm Little Crunch” attack, along with seasonal ribbon and bell accents, three expressive face plates, and an adorable Gilles-kun doll sporting a mini Santa hat, this Jeanne d’Arc figure is worthy of leading your upcoming Christmas crusade. 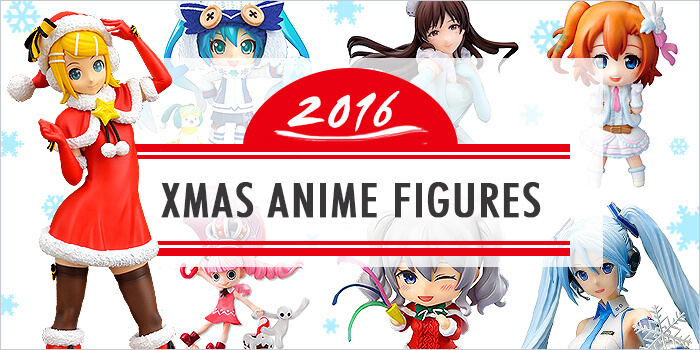 Hatsune Miku once again finds a special place on our annual Christmas anime figure list with an extensive selection fit for the holidays. And for more Vocaloid Christmas releases, be sure to check out our 2016 list! Hatsune Miku’s eighth “Snow” incarnation, chosen by fans as part of 2017’s Sapporo Snow Festival celebration, captures the beauty of Japan’s northernmost island at twilight as she twinkles like the starry night sky above Hokkaido in winter. Whether perched on a crescent moon, wandering the celestial heavens with her lantern, or conducting a lunar orchestra of astral proportions, Max Factory’s 2017 Twinkle Snow Miku Figma is a testament to the ethereal beauty and musical magic of Vocaloid’s dreamy diva. Originally a limited-edition February release, Good Smile Company’s chibified Twinkle Snow Miku Nendoroid drifted back into another limited production run this past July, giving fans a second chance to add this sweet soloist and her adorable rabbit Yukine to their Christmas collections. Whether sipping a warm cup of tea from the comfort of her cloud cushion, or snuggling up to the nearest star, Miku’s adorable displays will melt your heart—no matter how cold it is outside. Hatsune Miku dons her fluffy coat in this wintery blast from the past that celebrates the 2012 Snow Miku design. The perfect idol partner for Good Smile Company’s Fluffy Coat Snow Miku Nendoroid, Max Factory’s Figma rendition sings up a snowstorm with a little help from her removable mittens, earmuffs, shovel, and trusty microphone. A remix of the original 2015 release, this Hatsune Miku SPM Christmas Ver. 1.5 figure replaces Miku’s original green oval base with a space-saving red disc. The turquoise and black ribbon tied around her left leg—an homage to Miku’s traditional pop star colors—implies that though the seasons may change, this Vocaloid’s charm always remains. Sliding down Hokkaido’s frigid slopes, this Snow Miku figure marks the idol’s first 1/7-scale sculpt by Good Smile Company. An unwavering gaze adds momentum to her dynamic pose as she daringly speeds through a swirl of snow flurries and epic twin tails. With her semi-translucent, icy blue hair spiraling in her wake, it’s as though this realization of MONQ’s original illustration of the winter songstress has been frozen in time. There’s a winter wonderland of anime figures just waiting to be unwrapped. With a proxy and shipping service like FROM JAPAN, you can easily find all these charming Christmas collectibles and more online and have them delivered to your door. No matter how you celebrate “the most wonderful time of the year,” don’t forget to give the gift of anime figures! 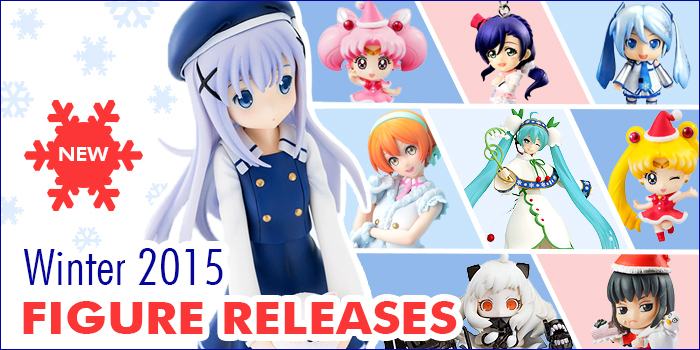 And for more Christmas anime figure gift ideas, be sure to check out our lists for 2015 and 2016.